Brass Cleaning and Annealing for Snipers Hide Members! Would you like to clean your brass with Stainless Steel media and Machine-Anneal them, but can't justify the cost for the equipment? I know, $500 for an annealer and $250 for the SS setup will buy a lot of new brass. I've been aiding SH members for several years and have serviced 100,000+ cases for 200+ members. This is not a business, I'm just a disabled shooter with time on my hands. For just .10/case* I will decap your cases, clean them using stainless steel media and machine-anneal them using Bench-Source annealers. For cases already decapped and SS cleaned, the cost for annealing is only .05/case. 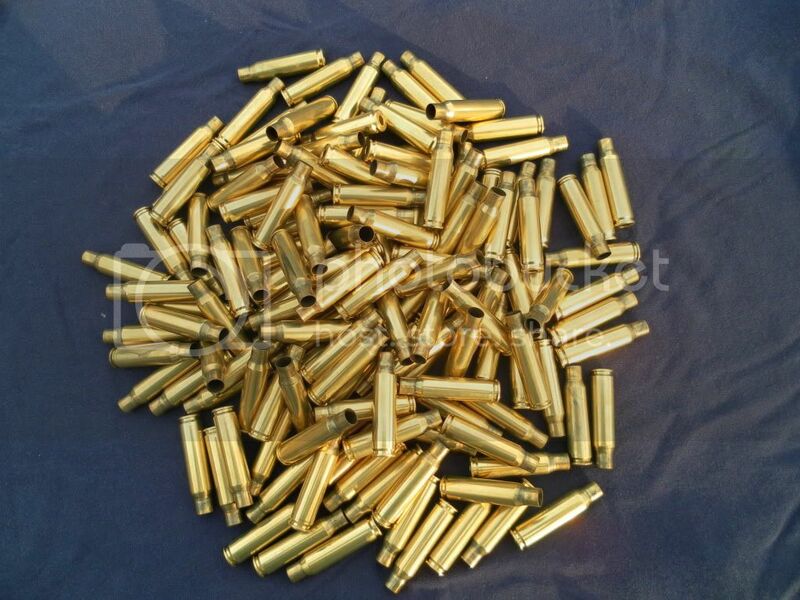 * for .338Lapua and other calibers with caseheads larger than .532" the cost is .25/case. I can do everything from .20Ruger to .375Magnums. Whether you have range pick-up dregs or carefully neck-turned benchrest cases, I'll treat them as my own. When to anneal is an often-asked question. Generally, cases shot from a factory-chambered barrel and re-sized using non-bushing dies will work-harden sooner than those fired from a gunsmith-chambered barrel and resized using bushing dies. If you're seeing a known-to-be-good load start to lose accuracy and it's not the round-count of the barrel, it is likely to be the brass. 24-72hr turnaround. No order too small or too big. Payment in Cash or Money Order can be sent with the brass. PayPal is also accepted, PayPal address is bobariana@comcast.net. Please include something with your name, address and Hide screen name with your order. Be sure to tape the box thoroughly and cushion the cases with bubble-wrap or some padding, the Postal Gorillas are not gentle. Please use a NEW box, used boxes often lead to crushed casemouths. My sincere thanks to Frank/Lowlight for letting me put this out there to the Hide membership. Please PM me with your questions and Good Shooting to all. Thanks to everyone who has used my service, I enjoy helping others shoot better. Yes, I am still doing this for Hide Members! Prices for Return Shipping have changed: Small boxes are $7.15, Medium are $13.60 and Large are $18.75. Turntimes are still 24-48 hours for most orders. Please shoot me a PM to let me know what you are sending or if you have any questions or special requests. In addition to this I can also do casemouth chamfering (the SS Cleaning can leave a small "lip" which should be removed before sizing) and primer-pocket tightening. Spring is a month away, get your brass reconditioned for the coming season. Hey Killshot, glad to have found this post. Will send PM shortly on some LC brass converted to 6.5 CM. New Hide, Old Hide.....doesn't matter, I'm still cleaning and annealing brass of all types (except .50s) for Hide Members. Please PM or email me prior to shipping and be sure to include your name, address and Hide name with your brass. Glad you are still at it. The brass you did for me last year was awesome. I'll have another batch this Spring! Sent you a PM, 300 pieces of 6creed heading your way on Monday. Tag. I'll be shipping some more brass to you shortly. Just got my 6mm Creedmoor brass back from Bob. Looks great and a quick turn around for 300 pieces! Thanks again! It must be getting warm, seeing more orders again! Get your brass ready for the range, field or matches. ON a Cold Mountain Top. Need to finish up neck turning then I'll be sending some more brass. Doing a 2,000-case .223 order and it is SO damn hot in the shop! Gents, Spring has sprung! Get your brass cleaned and annealed now. Just for reference, how many 6.5CM/ .308 brass fit in each of the different sized USPS Priority Flat Rate shipping boxes? I just received 400 223 lapua cases back from Bob, super quick turn around as always. It should also be noted that I didn't use any packing material inside my lapua boxes when I sent them, however Bob being the man he is, went ahead and put packing material in there for me on the way back. These little details just go to show the man's impeccable work ethic, and care for your brass.Thank you Bob! Couple of questions for you. Do you recommend sizing brass before sending in for ss cleaning and anneling or waiting to size after the process? i have never anneled brass before but have some 300 saum brass that was converted for 6.5 saum and I want to get as many loadings out of it as possible. What is your recommendation for number of firings before anneling (this is a custom GAP built rifle with tight chamber). Also have a bunch of 6.5 creed that is fired from factory savage LRP that I would like to have done, same question applies. You also mentioned that that you can chamfer case mouths due to the lip that can form from SS media and tighten primer pockets. What is the additional cost per piece for this? Excellent service you are providing, may be sending you some brass soon in various calibers depending on your answers to my questions. Is it easier for you to process if the brass is decapped and resized first? i just started reloading for 6.5 creedmoor and this sounds like a great deal for clean and annealed brass! You will need to size the cases after they've been annealed. They will need to be decapped before SS Cleaning (otherwise the pins can't get into the whole case or clean the pockets) which I can do with a decapping die which doesn't touch the case. I'd be happy to take care of them for you. June and Prairie Dog Season is upon us, time to get that bunch of tired brass reconditioned! School is out, Vacation-time is coming and Match Season is here. How is YOUR brass looking and performing? Tag. Do you have a phone that you can pm me the number to to arrange shipments at a later date? Thanks for a much needed service! As per normal from our last transactions (over a couple years) Bob got my 6 slr brass back in a timely fashion. I have used him for three or four calibers and the work is very nice with quick turnaround. July has been a slow month! Too many on vacation or too busy to shoot. A good time to get your brass reconditioned with no delay, be ready and shoot small ! Bump for the end of July! Just wanted to post up here, I tried out Killshot's services for the first time by sending him a bucketfull of 6.5 Creedmoor. His communication, service, and follow up is outstanding. He chided me for not using enough padding to protect my brass, but also gave me some tips on what to do before resizing my newly renovated brass. Process time was almost unnecessarily fast. Brass looks gorgeous, at a reasonable price. All in all, we have a great resource here. Please do not hesitate to use his services! I sent him out a medium box with 8x57 and 6.5x55 brass on Monday. I received it back looking beautiful on Saturday. Great service! He cannot be making any money doing this. Thank you Killshot44. Very sincere appreciation for your time and efforts. just happy to help the shooters who don't have the equipment to do this. I enjoy the work and it keeps me busy. Killshot, PM sent. 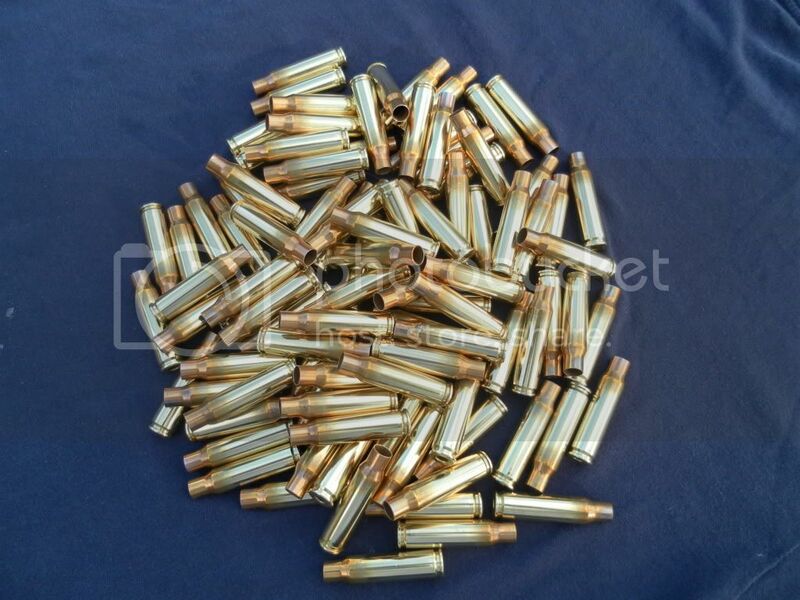 I have 200 rounds of Prime 6.5 CM brass that I want to send you. Is Bob still doing this annealing? I recently sent Bob 200 cases to deprime, clean and anneal. I am very happy with his service. He let me know when the brass arrived, and told me when it would ship out. He then sent a follow up email, confirming that brass had been shipped. And I had them back in a week. I would highly recommend him. Still doing cleaning and annealing for all Hide Members (and your friends)! Get your brass reconditioned before the fall matches, hunting season or load workups. Have range-pickups? Make them look like you just bought them - clean primer pockets, too! My favorite holiday...pumpkins WILL be sacrificed! Bob are you still doing Annealing?? Guys, I am ALWAYS available to my Snipers Hide friends (and their friends). Prices are the same as when I started in 2011, just .10/case for all but the super-magnums which are .25/case. Is your weather is shutting down your shooting for a while?, now’s the perfect time to get your brass back into shape. Most orders are done in 48 hours, it’s usually a week from shipping to getting your spankin’, like-new cases back, ready to size and load. Hope everyone had a great Thanksgiving, fills their Deer Tags and gets the lights on the house before the wife even mentions them. Thanks...very please with the fast quality service! Replied to all. Send me your brass! Happy 2018 bump for everyone jonesing to get some rounds downrange! This weather won’t last forever - there’ll be prairie dogs to blast and local matches to win before you know it. Gather up that neglected brass (how many times fired was it?) and get your stuff back ready to size and load in about a week door-to-door.